If you have (or have an interest in) any of Apple’s ‘mobile devices’ then this could be the group for you. Although the majority of our members have iPads, we do have iPhone and iPod owners, and the group caters for owners of all three types of device. 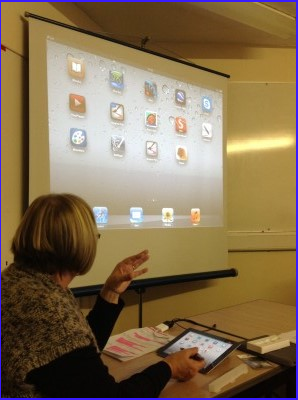 We are a friendly, informal group where the emphasis is on the practical rather than theoretical – this is NOT a ‘computer experts group’ – it is aimed firmly at those of any level who just want to know how to use their iPad. Our current meeting structure is that we start with a practical session, where members can work (individually or with others) through practical sheets that demonstrate a particular aspect of the iPad. During this session, members have the chance to discuss one-to-one any problems or queries they may have. After refreshments we have a discussion/presentation session, where (a) members give demonstrations of something they have achieved or learned with the iPad and/or (b) we go through the issues and principles raised during the practical session. During our first year we have tackled many of the major areas of general interest, and are now revisiting these as new members join (and existing members forget! ), while at the same time branching out to study some of the apps and uses that our members have found, or would like to know more about. The group currently meets at Southwick Village Hall on the second and fourth Wednesdays each month, though as the number of interested iPad owners continues to expand, we may have to consider additional days and/or locations. Meetings are 2 hours (from 9.30 – 11.30). Current membership is 26, with a typical attendance of around 16 each session. If you are interested in joining us please contact the Groups Coordinator.